It didn't seem all that long ago, that they only beauty sponge option was the Beauty Blender (the original and still one of the best in my humble opinion); fast forward a few years and now just about every brush brand and in some instances make-up company has an often cheaper counterpart. I get it, I really do - not everyone has an endless flow of cash to throw at a sponge, that may or may not work. For that reason alone I'm glad there are cheaper alternatives, one such being the Barely Prep, Blot & Blend Sponge. The Barely Prep, Blot & Blend Sponge is of course constructed from foam - PU, said to be hygienic and not prone to bacteria. I'm not sure how true that is and as a result I do wash all my sponges and brushes after each use due to my acne prone skin. To use, much like any other sponge of this type you run under a warm tap and squeeze - by doing so it expands and does not absorb excessive levels of product. As you can see the Barely Prep, Blot & Blend Sponge is a little on the dinky side (great for the under eye area) and oddly is not promoted as being a tool for applying make-up, rather skin care including moisturisers and more bizarrely cleansers. At first I thought this was a little insane, however not only is it economical (no need for wipes, cotton pads etc) and environmentally friendly but it ensures the product in question is actually absorbed by the skin. The idea is that you stipple (bouncing movements across the surface of the skin) on any product rather than rubbing on with your hands, such motion encourages blood and lymph circulation; hopefully allowing the skin to absorb the product far better. It also may give the impression of healthier, more radiant skin and could even reduce the appearance dark circles. I should also add that as this is foam it is super gentle on the skin and works well with oil based make-up removers, especially around the eye area - no tugging or pulling on such a sensitive area of the face. Yes the Barely Prep, Blot & Blend Sponge has been designed for skin care but like most beauty tools, it can be used how you wish. It can be used to apply foundation, cream products and even left dry for powder products. If you have a foundation that you find to be a little on the heavy side, be it in finish or texture this is a great sponge to use for a lighter and fresher finish. It is also great for dabbing on cream blushes using the tapered edge. However you choose to use it, the Barely Prep, Blot & Blend Sponge is a great addition to any make-up bag and so well priced too! 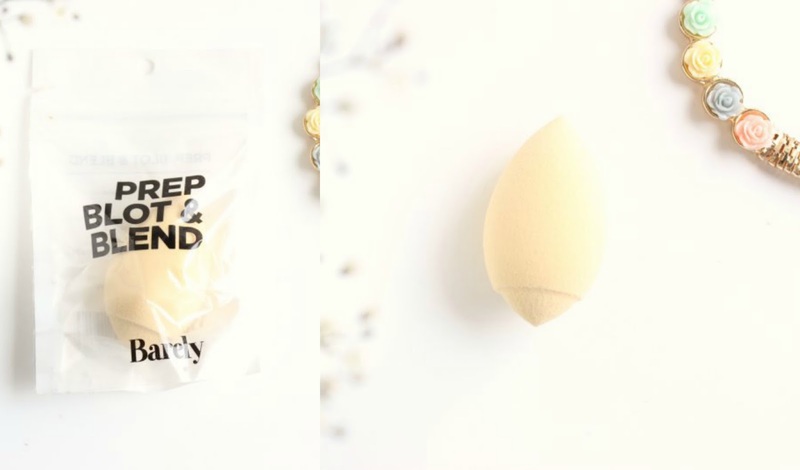 Barely Prep, Blot & Blend Sponge £5.99 via Feel Unique - link. This one sounds really interesting, I need to try it out. I agree that the Beauty Blender is a little overly priced, but it's definitely worth it. Though, I do have 2 other knock offs that were basically pocket change and they work just as well! This one looks like it'd be a good one. I've never thought to use sponges to apply skin care, but it is an interesting idea. I like the beauty blender, but it's pricey. Other options I've tried don't typically expand when wet! Interesting! I heard the Pure Beauty Blender (white ones) are designed for skin care purposes too. But a sponge to clean your makeup? Never heard or think of it. How do you use it for cleansing? I don't quite understand the process in my head. I would not have expected this to be a tool for skin care, but more foundation as it is very similar to the beauty blender. I have never been a sponge person when it comes to applying things but I really do like the sound of this and for £5.99 it is worth a go. I honestly love my £1.50 Primark sponge, but I like the idea of this.